It’s said the best day of the year in Alabama to go grocery shopping, get a table without waiting at Cracker Barrel or even drive blindfolded, is the last Saturday of November when Alabama plays Auburn and the state, and it’s five million residents go on television lockdown for three-plus hours. Alabama v Auburn is not quite Roe v Wade but it’s something not to be taken lightly in these parts. In fact it might be more important. Even though they only play once a year, the results and the anticipation for the next one lasts a whole ‘nother year. You are either one or the other. You either end your conversations with ‘Roll Tide’ or ‘War Eagle.’ Your parents have thirty days after your birth to file with the local county registrar whether your kid will grow up pulling for Alabama or Auburn. If you relocate into the state you have ninety days to register. 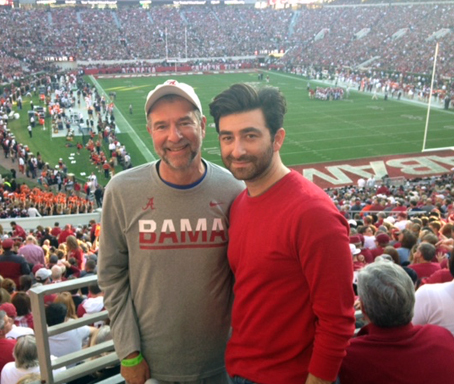 So on Saturday, with oldest son Jason in Birmingham for the holiday and wanting to go to what we call the Iron Bowl, I put aside my rapidly increasing distaste for crowds, traffic, getting jostled by strangers and the physical pain of getting up and down out of my seat to let someone pass or to see a pass, and for the first time in half a decade agreed to go. What normally is under an hour’s drive today took two for the privilege of being part of a cozy 102,000 in the stadium and probably another 100,000 who ventured to Tuscaloosa with no intention of going to the game, but just to say they were there. And Alabama, the top team in all the land on a 22 game winning streak, made it 23 straight with an uninspired 30-12 win over outclassed Auburn in a game which Bama was favored by seventeen and a half points. And even though it was an extremely partisan home crowd as you would expect for a rivalry this deep and bitter, the largest combined cheer of the day was at halftime when the local celeb weatherman appeared on the big screens. He told both the crimson and orange faithful that a “weather event” would be happening this week with two to four inches of rain expected. If you didn’t know better you would have thought by the roar that Joe Namath just returned to his alma mater in uniform. You see, it’s been over seventy days since we had rain in central Alabama. Everything is brown and arid. We’ve had no measurable rain. Seventy days is a long time ago. It’s so long ago that the last time we had rain Fidel was smokin’ in Havana; Donald was trailing in the polls by double digits and sliding and it still had been 108 years since the Cubs won the World Series. Seventy days without rain. The world can clearly change in seventy days. So, rain, rain please don’t stay away and Roll Tide, y’all.